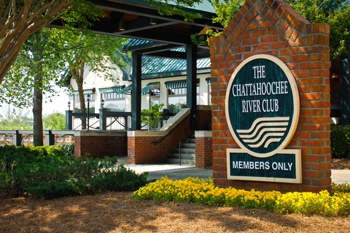 Established in 1990 on the river’s edge at 12th Street and Bay Avenue, The Chattahoochee River Club overlooks the cascades of the beautiful Chattahoochee River. Now a tradition in a community rich with history, the Club combines the exclusive amenities of a private Club with the entrepreneurial spirit that keeps the valley moving ahead. In fact, every aspect of the Club, from its invitation-only membership to its fine cuisine and service, is designed to enhance the personal enjoyment of its members or their sponsored guests. The Club’s atmosphere is reminiscent of a gracious country manor. The mood is elegant but relaxed and comfortable. In fact, the River Club feels like a haven of refuge and a home away from home, an oasis where a member or guest’s personal preferences are just a request away, and good company can always be found. Imagine relaxing with business associates on the spacious deck while looking at the white water of the river or entertaining a prospective client in the private elegance of the main dining room where the cuisine and service is topped only by the magnificent view of the river. A quiet blending of French and English styles, the Club’s décor is accented with fine antiques, luxurious carpets and a beautiful collection of paintings and oriental porcelain. The color palate, ranging from rich teals to soothing terra cottas, draws its inspiration from the natural beauty of the river and the surrounding architecture.